b. 1937 La Quinta CA. We are so accustomed to seeing line drawings that we tend to forget that lines are seldom seen in nature. Lines are an invention of humans and they often are used as a form of shorthand to depict a subject without focusing on every detail. Because it is in our nature to want a sense of completion, our mind supplies meaning to spaces within a drawing. An apple is a three-dimensional solid object but by drawing an outline of it on paper to indicate where the substance of it ends and the space around it begins, the idea “apple” is communicated. Our mind completes and interprets the area enclosed by the line. There are no actual lines on a camel’s face but, in Camel Pondering the Needle, Julie Hirsch follows the contours of its features. Even though other visual elements such as color, texture, and shape are missing, line is all that is needed to communicate its form. A closer look, however, is required to discover the drawing’s central message. The drawing refers to Christ’s statement, “It is easier for a camel to go through the eye of a needle, than a rich man to enter into the kingdom of God” (Mark 10:25). Hirsch created an image of a camel contemplating this seemingly impossible task. The title tells us the camel is pondering a needle yet this beast of burden is looking straight ahead with no obvious needle in its line of vision. 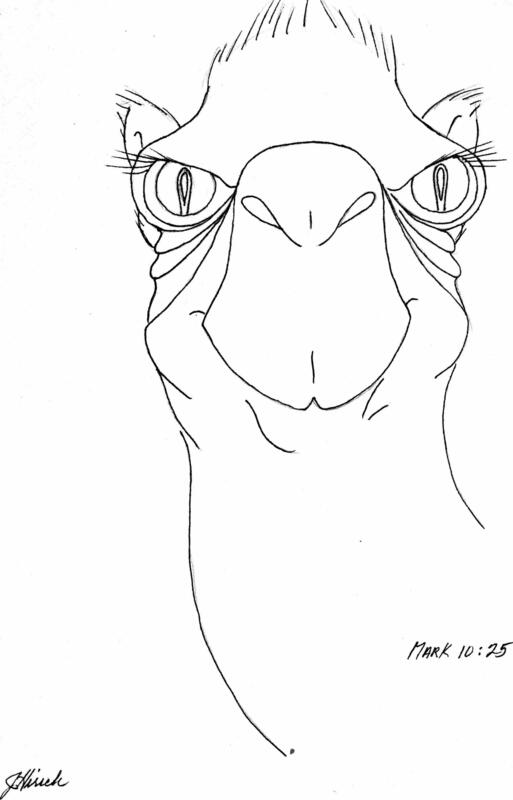 There is no dotted line (as in cartoons) connecting the eyes of the camel to a needle. The needle’s eye, however, is an essential part of the drawing. Artists such as Jan van Eyck and Diego Velazquez introduced subjects into a painting by reflecting them in a mirror. In Hirsch’s drawing we are given the sense that the eye of the needle is being observed keenly and being pondered deeply as we see its reflection in the camel’s eyes. Before there were written languages, drawings were used as a means of communication. When Phoenicians wanted to communicate a visual image of an ox (called “aleph”), they made a simple line drawing of its head and horns. At the time they made their phonetic alphabet (the word phonetic is derived from “Phoenician”) the drawing of an ox was simplified further into three straight lines. It looked like the letter “A” toppled over on its side with the cross bar extended. It is not difficult to imagine these lines as an ox head with horns and ears. “Aleph,” as a pictograph of an ox, became the first letter of the Phoenician alphabet (“aleph” continues to be the first letter of Hebrew and other alphabets). Their second letter was “beth,” their word for “house.” When the Greeks borrowed these letters; they placed the point of the “A” upward and “aleph” was changed to alpha in order to fit the sounds used in their language. The Greeks called their second letter beta. These two pictographs became the source of our word “alphabet.” In our alphabet, simple lines are made to create letters that represent sounds, and letters are placed together to make words. This contributed immeasurably to the spread of knowledge. “A picture is worth a thousand words” is not always true; yet today, thousands of years after the invention of written languages, drawings and other visual media continue to be essential. They enable us to communicate ideas that are impossible to express in words.